HFE 205Y. 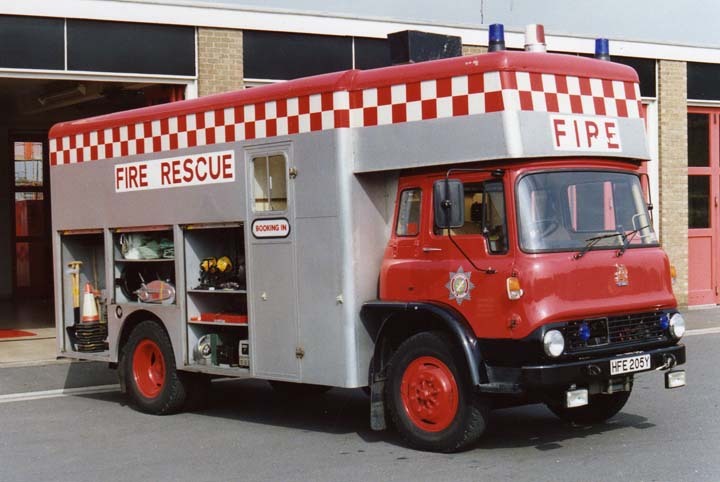 1982.Lincolnshire Fire Brigade. Bedford TKG Emergency Tender/Control Unit. Bodywork by Warner. based at South Park Avenue, Lincoln fire station. Paul, nice to see a an old Lincolnshire bedford, have been to a few jobs over the years where this R.T turned up. Have you any other Lincolnshire pictures I am trying to find a picture of an old "R" reg Bedford we had at Saxilby (A7) in the late 70, s and 80, s.
Added by Nick Willey on 30 April 2008. Added by Stephen Kirkpatrick on 17 May 2009. The Luton head is unusual.What was kept in there? Added by Rob Johnson on 25 May 2017. Added by Alan Ramsay on 13 June 2017. Alan - I couldn't think of any other reason to have it there, either. Perhaps it was just a low-cost option the brigade could not resist - or maybe the appliance body was just a standard removal van box with some minor modifications, such as building in the lockers and side doors... a much cheaper solution than a true custom built job! The dual role as an R&R unit is an interesting hypothesis, though. Is it so obvious that it could be the real answer? Added by Rob Johnson on 15 June 2017.